I have recently upgrade to windows 8.1 pro and am reinstalling ALL of my software. I am having ONE issue though, the HDR express that came with my "Creator NXT Pro 2" says I have no activations left, and as far as I can tell there is no way to contact Roxio support without paying....for support. 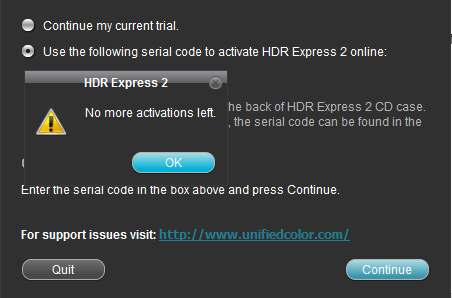 So I came here to ask the pros, Is there a trick to getting HDR express to register at this point? I has been a year since I last installed HDR, it's not like I do reinstalls every few months.What ever happened to keys resetting after 6 months or so?? They work fine with previous versions and I finally threw in the towel and added Mozilla's Firefox which I use when I come here Other Browsers will work as well. I haven't used HDR Express either, but would think if there's an issue like that, it would have to go through Rox-Ralf. You can contact him using the link in my signature below about resetting your installation count. Explain your situation to him. It may take a day or three for him to get back to you. Howdy Jim!! How y’all been man. You know I should have remembered about the forums from the last time I was here, I downloaded FF tonight and it is a much better option for these forums. And thanks for the reply man! PS: you never used HDR E?? man that program is a hoot!! And thank you d_Dewey for your reply and lead on Rox-Ralf, I’ll look into contacting him if anything like this happens again. I did get it solved tonight, but let me tell you what happened in case anyone else needs to do this. BUT this morning after poking around for awhile I finally found a support email address on the UC site and sent out an email explaining my problem and tonight a fine gent named Al hit me back and said he was resetting my keys!! So, if anyone can’t find that support email let me know through PM and I’ll hook ya up. thanks again guys!! I'm off to do some more installing almost done!